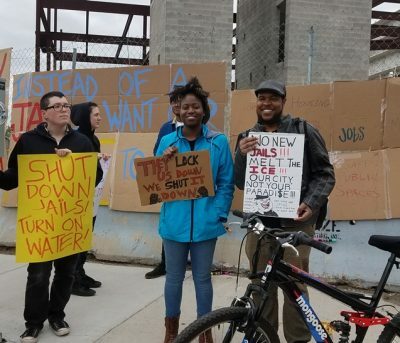 DETROIT — As evening rush hour traffic raced down Gratiot April 21, youth from Black Youth Project 100 and others, including Mertilla Jones, grandmother of Aiyana Jones, protested outside the foreboding structure of the half-done Wayne County Jail, calling for millions to be spent on schools, housing, and water for the people instead. “I don’t want to see any jail, abolish jails, stop mass incarceration of Black people, it’s all connected,” a young woman named Yana told VOD. David Langstaff of the Michigan Abolition Alliance said the group earlier disrupted a Wayne County Commission meeting on multi-billionaire developer Dan Gilbert’s proposal to build a soccer stadium at the failed jail site, while constructing an entirely new “justice complex” at the current site of the Wayne County Lincoln Hall of Justice (Youth Division) on East Forest and I-75. Arthur, a leader of Black Youth Project 100, a national organization, spoke at the rally. He said the group has chapters here in Detroit, Chicago, New York City, and New Orleans, among others. They have a Facebook page at https://www.facebook.com/BYP100 and a website at http://byp100.org/. The Detroit Public School system, largely under state-appointed CEO’s and emergency managers, has shut down over 224 schools in the city beginning in 2005 with its initial closing of 50 schools. Last year, the entire district was demolished and replaced with the “Detroit Public Schools Community District.” The previous DPS was left to pay off the gargantuan debt accumulated by the state during its reign since 1999. The state recently claimed it would not shut 24 more schools “for the time being,” but would hand over such classic historic schools as Durfee Middle/Elementary to a “non-profit” organization called “Life Re-Modeled,” which intends to transform them into incubators for entrepreneurs. Many activists in Detroit continue to fight the closures as depicted in the video by We the People of Detroit and Kate Levy below. 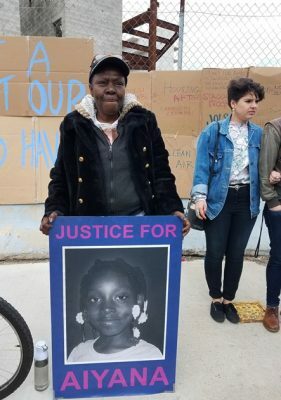 Mertilla Jones, who was sleeping with her seven-year-old granddaughter Aiyana Jones when a military-style Detroit police raid team broke into their home May 16, 2011, and shot the child to death, joined the protest at the Wayne County Jai as well. She called for the youth present to attend a protest called by P.O.S.T. (Protect Our Stolen Treasures) on the second anniversary of the multi-police task force execution of Terrance Kellom April 27, 2015.The protest will take place Thurs. April 27, 2017 from 1 to 3 p.m. at the Frank Murphy Hall across the street from the Wayne County Jail ruin. Jones said she will not stop fighting the system that slaughtered her beautiful granddaughter and has incarcerated Aiyana’s father Charles Jones and his brother Norbert Jones for crimes they did not commit. They are part of the 2.5 million people incarcerated in the U.S., which has five percent of the world’s population, but 25 percent of its incarcerated population. Jones was at the protest to represent P.O.S.T. 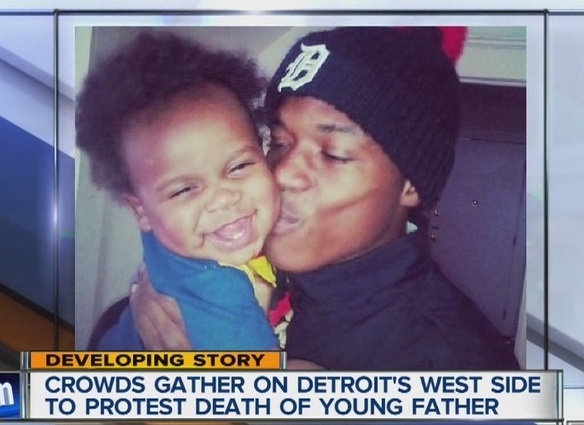 as well, part of a national coalition of families and friends who have lost loved ones to police violence. Frank Murphy Hall of Justice, Gratiot at St. Antoine in downtown Detroit.